With the same easy click-in KeyFit� attachment as the Cortina� stroller, the Together� accommodates a car seat in both the front and rear seats. Exclusive forward-fold front seat accepts the KeyFit� or KeyFit� 30 using exclusive Fold & Click� car seat attachment without the need for add-on bars or straps - no more missing pieces! The rear seat has a full recline for bassinet enclosure or to accept an additional car seat. 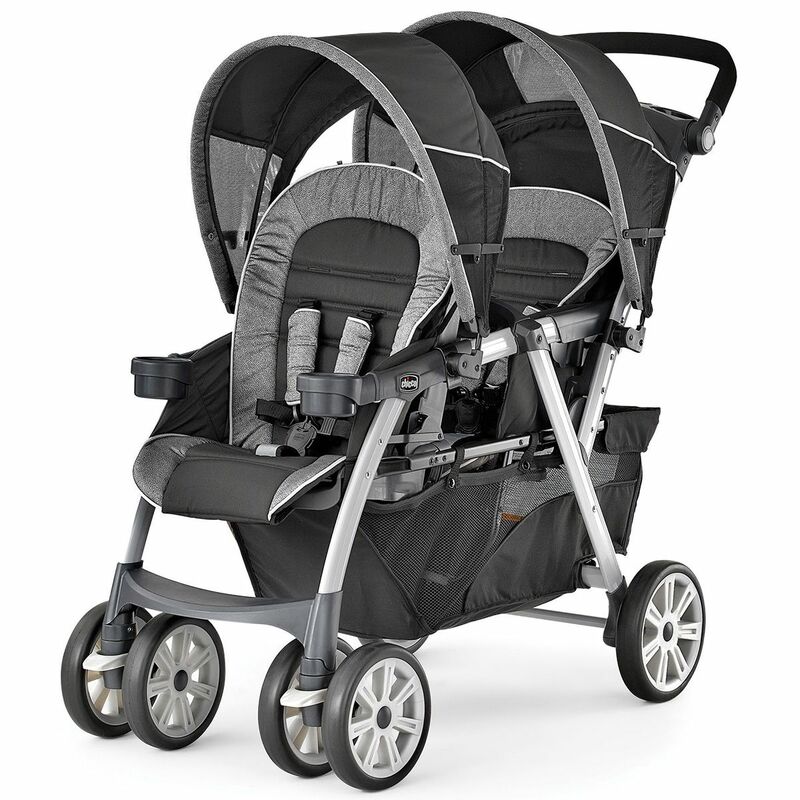 A sleek and modern anodized aluminum frame stroller with a unique tubing profile, the Cortina� Together� is 15% lighter than MOST comparably featured double strollers. Very sleek large stroller. It is pretty big but just a bulkier version of the single Chico bravo stroller. My toddler sits comfortably in the back and looks at her baby sister in the car seat. It�€™s pretty durable and manoeuvres well. The only disadvantage is how bulky it is when transporting it but you can�€™t really get a double stroller that�€™s comfortable when assembled to be easy transporting when collapsed. I�€™ll start by saying that this stroller is BIG. But that�€™s to be expected with a double stroller that can hold two infant carrier child seats. It is also very long, which can make maneuvering a bit of a challenge, especially in tight spaces. Turning radius is wide (and turning takes getting used to), yet in spite of all of those things, this is a great stroller. Setup is pretty quick and painless. This is a sturdy and nice looking stroller and I would highly recommend it to anyone who has two small children and needs a product like this, ESPECIALLY if they already have Chicco Keyfit seats. Albee Baby was great to order through: they had the best price on this stroller by far and were prompt with delivery. My twins are 8 months old and I dread having to use this stroller because it's SO hard to steer. It doesn't matter if it's inside, outside, smooth or rough surfaces - the stroller doesn't do well. Granted it's going to be large and a bit heavy due to it being a double, but it's frustrating trying to maneuver through a store and having to fight for the wheels to turn or to access the diaper bag that's in the storage basket on the bottom of the stroller ... under both kids. Since I have twins, I have a tote-sized diaper bag and trying to get to it through the small opening in the basket isn't exactly ideal. I end up carrying the diaper bag because the only other option to get to it in the bottom of the stroller is to hope that taking one of the kids and their carrier out of the stroller gives me enough room to grab the bag - but I usuallu need to take them both out. Bottom line: This stroller should be a LOT cheaper for what you get. Had this for a month or so and it works great it's very large so no fighting about who is touching who ! A little on the bulky side but that's expected with a double stroller. Navigates great! Rear seat of stroller padding blocks installation and removal of car seat. Poor design, unhelpful fixes. I registered for this stroller, without realizing how big the frame is, when I had a newborn and two year old. I loved the single Chicco KeyFit�‚® Caddy and was hoping for similar ease of use and versatility. Unfortunately, the Cortina's frame was so big and bulky that I could not fit it into the trunk of my Toyota Camry and so it became impractical to have as a primary stroller for visiting stores and parks. If you have much larger trunk space, you might find this stroller more useful. I registered for this stroller, without realizing how big the frame is, when I had a newborn and two year old. I loved the single Chicco KeyFit Caddy and was hoping for similar ease of use and versatility. Unfortunately, the Cortina's frame was so big and bulky that I could not fit it into the trunk of my Toyota Camry and so it became impractical to have as a primary stroller for visiting stores and parks. If you have much larger trunk space, you might find this stroller more useful. I bought this stroller when our second son was born. I knew we would need a double stroller for both of them to ride in. While this is a very nice stroller, I've found over the past couple of months it isn't always practical. It's very nice indoors, malls, etc. but as far as outdoor use (zoo's, parks etc.) it is BRUTAL. My 30lb 2 year old rides in the front and it is so hard to turn and maneuver. I recently purchased a side by side jogging stroller which is much better for outdoor use. So bottom line - if you plan on just using it indoors, great! But if you want to take it on walks or anything outside, I recommend also budgeting to buy a jogging stroller. This stroller only fits 2 infants if one is in a car seat. The front seat doesn't recline at all, so not only can an infant not sit in it, but a toddler can't nap. I have the Chicco Keyfit carseats, but it would be nice to be able to use the stroller without them. I'm extremely disappointed with my purchase and will be buying a more practical stroller. Very easy to unfold and use! Not too bulky! Works perfect with our Chicco Keyfit 30 Zip Air carseats. Incredibly easy to assemble and to switch out any of the accessories and the carseats. Very sturdy and solid construction. 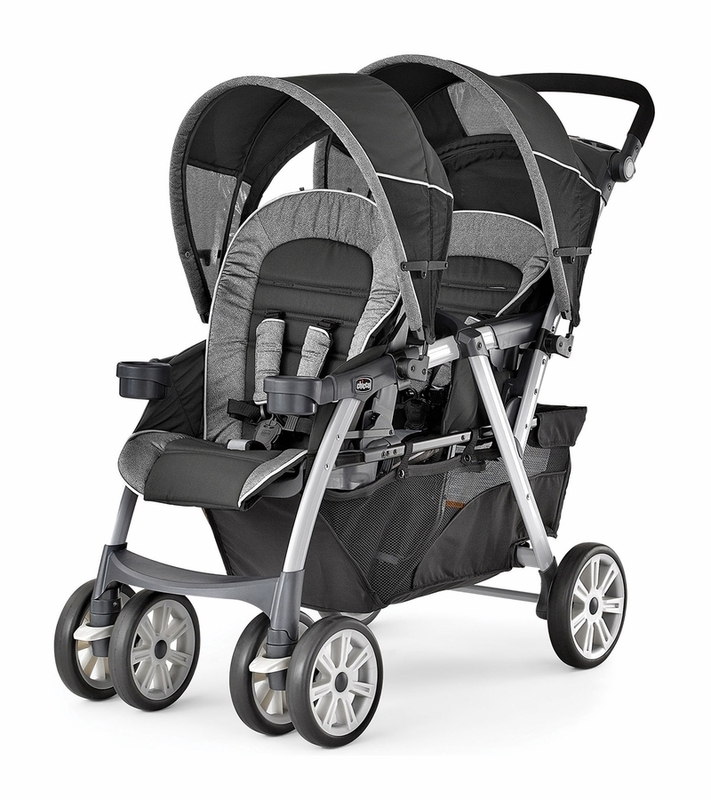 Ultimately, this is a great Stoller for peoplewho have two little ones and a massive trunk! We bought this for our toddler and newborn and thoughbtjenstroller seems functionally sound, it doesnt fit easily in the back of our MDX when the 3rd row is in use. A dealbreaker for us, unfortunately. Bought for my son who has a one year and a infant. They love it. ProsBoth small children fit comfortably and easy too push. ConsHeavy takes a lot of room in car trunk. I bought this for my newborn and my 22 month baby girl and I love every single thing about it. I can have either my toddler in the front and my newborn in her car seat keyfit 30 in the back or viceversa and they are so comfortable either way. Totally recommend this stroller! Very happy with this stroller. It is perfect for my 5 month old and my 3 year old and will grow with both of them. Easy to put together and start using. And fairly easy to control considering it's size. I can maneuver it with one hand. Only downside is that it will take up most of the truck space in my SUV but I guess that cannot be helped. Highly recommend it. With twins on the way and a toddler, this stroller fits all of our needs. We can use it for both infant in carriers or one infant and toddler and wear the other infant. The recli e seats make it nice when the twins are a lite older and don't need to be in their carriers anymore. This stroller folds up easily and is very easy to assemble. It is easy to push and turn. I would recommend this double stroller to anyone looking for a stroller to fit many needs. This stroller is impossible to turn. Very sturdy very comfortable. No complaints from my children they LoVE iT. But it doesn't fit anywhere. It's impossible to turn. It's deff not made for outside. It's rather heavy. Takes up ALOT of space in the car. Overpriced. Works great with my Chico keyfit car seats! Easy peasy assembly. I bought Chicco Papyrus portable booster a month ago and I really like it; it doesn't waigh much, comes with a to-go bag, usage and folding is easy and intuitive. I just wish the mounting brackets would allow to mount the travel seat on thicker wooden tables too, and maybe come in different colors. This stroller is very nice quality. It is easy to unfold and fold, and the car seat (sold separately) pops in and out easily. I love the versatility that comes with this stroller, since it can take two car seats, just one car seat (in either the front or back), or just hold two children with no car seats. It also has a really nice, large basket for storage. The only con is that it is very heavy, but not heavier than I would expect for a high quality double stroller. It is still very easy to steer and turn so the weight is not really an issue for me except picking it up to put it in the car. We just recently purchased this stroller for my toddler and 4 mo old for our vacation. I was very impressed at how smoothly the stroller rides and how easily it was able to negotiate rough terrain. With my toddler in the front, it does make it a little harder to push uphill, but with the lockable front wheels, I didn't have to worry about one wheel getting turned a different direction. A star was deducted because the umbrella attachments do not cover much of either child. Great chair and attaches great to our table and to most restaurant tables...There are 3 issues with this chair. 1. The Penguin design rubber table grip is IMPOSSIBLE to clean. There are so many nooks and crannies, you must disconnect the chair and wash it in the sink to get it clean. Really annoying 2. The Cloth backing is next to IMPOSSIBLE to remove to wash. The shape of the bar and the stupidly tight fabric make your hands and fingers go numb as you try to get it off -- much less putting it back on. Over time, it stretches a little and the white cushion on the bar starts to break off, making it slightly easier to take on/off -- but still really difficult. 3. The chair has a slight gap between the front edge and the table. This allows all kinds of crumbs, food, etc. to fall in between and on to the floor. If you can deal with this issues, the chair is definitely solid and allows my daughter to sit comfortably without taking up a ton of floor space. This stroller is beautiful - the two year old approves and has already requested several rides around the living room. Looks like it's functional for toddler & newborn. It's much larger than the single stroller and I haven't tried folding it up or lifting it into my SUV yet - fingers crossed! We bought one at a store about 9 months ago for our first Grand Child and loved it. We have a second Grand Child coming and started looking for a second Chiccousa - Hook On Travel Seat - Papyrus and couldn't find it. So we went to the Chicco Shop web site and found it. Know were happy again and very pleased. The product is great! It is very safe and easy to use. It works prefect on every table we have used it on. Our Grand Child Love It! As great as a high chair is, this the best thing since sliced cheese. This stroller has made traveling with my newborn and toddler so easy. I don't have to carry anyone or anything including the diaper bag! I took one star off for two reasons: the back seat does NOT recline all the way. It is called the "bassinet" position, but it is ever so slightly inclined. This makes a big difference when you have a swaddled newborn that keeps sinking into their blanket. For safety I have to adjust her often, or just use the key fit 30 infant seat. The other reason is because my iPhone with an otter box cover does not fit in the slim pocket on the handlebar, which I assume would be for phones. I was worried at first about this stroller because of the price. I have a 3 year old and a 2 month old who love this stroller now. It is very big and barely fits in the back of my SUV but it's so nice to have plenty of room for both kids. We have the Chico keyfit car seat that fits perfectly in the seat. My favorite part of the stroller is how easy it is to use. I was surprised at how easy it drives and turns actually. I bought this stoller 2 weeks ago because it wasn't easy moving around with ny toddler and my newborn. It was really worth it. The downside of this product is that it is heavy. It isn't easy to carry into the car aside this, it is effective. I bought this as a gift for my grandson and his wife. The shower is this week-end, so it has not been opened yet. It is an upgrade from the one she picked out, so I am hoping she will be thrilled. So, I'm hoping for a 5 star. My wife bought this stroller. I hate it. Falls apart and she can barely even pick up, super heavy! Don't waste the money! My children are 18 and 14. I used this seat for both - religiously. We took it to restaurants, I had it hook on my island counter in my kitchen which took up less space than a giant highchair (which I had but rarely used when they could sit up), I never left home without it. You hook it on and done. It takes seconds. It is very convenient. Plus, you never know what it lurking in those restaurant highchairs they provide. I was recently invited to a baby shower and without a second thought ordered one. Any one that has a baby, this is a must have. My kids love it I have a 2 year old and a 3 month old they both love for me to drive them around in it I call it the train because it's a really long stroller especially if you've never had a double stroller before it's something that takes awhile to get used to driving and carrying it out the trunk and putting it back in ..it was heavy at first put I got used to it. ConsBe careful what car you have ! You have to make sure you have a really big trunk because when you close the stroller its really long I have a Honda CR-V and at first it was so hard for me to make it fit in my trunk I had to take off the cup holders from the front seat of the stroller and the stroller was still to big I always have to push it to make it fit . It weighs 35lbs so if it doesn't fit in the trunk you will be struggling with it to make it fit . We purchased this stroller to accommodate our newborn twins. First thing I noticed is that, as a double stroller, it does not take up much more space than our single Chicco stroller does when folded (just a touch wider, and a touch taller). The stroller truly is one hand operable, which is nice. Both the infant car seats integrate flawlessly and it "drives" very smoothly. It's a little long (front to back, when open) but I think with time it will be easy to adjust to making turns with it. Have taken it through a couple different grocery stores, to the park, hospital, etc and have not had any issues with it. It can be a little tight in some elevators, but it's much better than having to carry two car seats up the stairs. We did test our 3 year old toddler in it and she fit comfortably in both the front and rear seat. We also purchased a Chicco "umbrella" stroller for her, which she loves. There is ample storage underneath, and they added a nice zipper door to it so that you can access the storage even when the rear seat is lowered to handle an infant seat. The construction seems very solid and I don't feel like there are any flimsy or cheap parts that will easily break. Very satisfied with the purchase and would recommend it to anyone looking for a double stroller. I love how easy it folds the the durability! I bought W years ago and I love how easy it folds and the durability of this stroller! I got very fast delivery. ..very good price. As for stiller I love it. Chicco carseat is a perfect fit. My kids love me riding them in it. Couldn't be happier with stroller. Always good products and service. Never have a problem with this site. Love it. Heavy and hard to turn! I bought this stroller less than 2 months ago and just returned it yesterday. At first I was excited that it was a little shorter when folded up than the graco double stroller (which is huge!). But after going to my first outdoor event that I used it all day, I realize that I had made such a bad choice. The stroller is extremely heavy for me to turn!!! My 2 year old is only 34 pounds, and my one year old daughter is 20 pounds; therefore I was within their weight requirements. But I mean I could not turn this stroller well on grass at all, barely even pavement. Worst stroller ever; way too expensive, heavy, and so hard to turn!! From resteraunts to vacations away this chair has been with us everywhere. First purchased for our first child now comes with us again for our second. A must have. I bought this recently so my 6 month old grandson could sit at our dining room table while we ate. He had the biggest smile on his face as he sat for the first time with the entire family. We have a six inch lip on our table and the seat cleared it without a problem. No other brand had this feature. I highly recommend this Chicco product. We were in dire need of a double stroller for my 3 month old and 21 month old. We looked at many brands but decided to go with the same brand as our car seat. When we received it, it was really easy to put together, really lightweight, and the steering is amazing! Love it! This seems like a good quality for the price and when compared to a lot of the double strollers, pretty reasonably priced. However, it is very heavy and doesn't fold down as much as I thought it would. Plus I really didn't like that I couldn't see either child very well. I ended up sending it back and went with the side by side version.